Girl Scout Seniors know the world is not ideal. This journey is their chance to imagine a perfect world—for girls. They’re invited to create their vision as an art project—in any medium they choose. Then they’ll take action to make their vision a reality. Leaders, after all, are visionaries! Change It – complete a Take Action Project that moves the world (or a community) one step closer to ideal. Seniors investigate the food network (no not cable TV—the real one that gets each piece of food to the table). As they ponder the dirt on land use around the world (corn's a big issue! 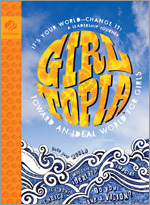 ), girls get down to the science and roots of complex and global food issues. Girls plan and conduct a local "food forage" to scope out their "food print" choices, and talk to scientists, local growers, and business owners—and even global hunger experts. Using what they learn, girls consider their "leader prints" as they decide who and what they can cultivate en route to a Take Action Project that positively impacts their food network. Along the way, Seniors take time to enjoy a "truly happy meal" together, experiment with new recipes, and try out being "locavores" who know how to savor local bounty. So what about career choices and networking? Sew what about sewing? Seniors have a chance to try these on, too! When they add Harvest, a prestigious new leadership award to their collection, Girl Scout Seniors will truly be proud of what they have sown on Earth! Get your leader print going! Here's the path: Identify, and dig into, a food or land issue, tapping some community experts as you go. Maybe you've met growers, gardeners, nutritionists or others in your region and have ideas about challenges they face. Maybe you've improved your food print and want to inspire others. Want your school to host a farmers' market? Got a seed of an idea from this book? Want to team up with other Seniors? Just choose an issue that allows you to use your unique talents and learn something new, too! 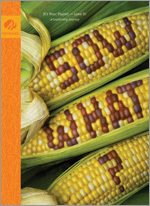 Capture your vision for change in a Harvest Plan that includes: Your very own "So What? "—your goal, why it matters, how it will benefit both the planet and people. Say it in a way that gets others interested and involved! Show how even simple actions and decisions impact the larger food network. Remember: There's no need to go it alone. Who can you turn to for input and support? What specific impact do you hope to have? Name it! And when you have executed your plan, check back. Have you achieved it? Maybe you will have achieved other results, too, especially if you find yourself needing to adjust your plans along the way. Your project can be big or small, depending on your time and interest. Either way, strive for a sustainable impact. You may push for a new policy or for a change in an existing one. You don't need to start something from scratch. When it comes to sisterhood, what girls start can spiral outward and change the world. Through Mission: Sisterhood!girls see the stories of sisterhood all around them and grow as leaders by widening their networks and broadening their world. 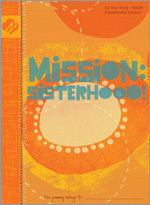 Sisterhood Award - Seniors understand the power of sisterhood in their own lives and in the world. Girls define a sisterhood issue, create a plan for how to Take Action andput it in place!